Blue Ivy must be proud. The famous toddler's parents, Jay Z and Beyoncé, are 2013's highest-earning celebrity couple, according to Forbes magazine. Even better, the superstar duo has pulled off that feat for the second year in a row. 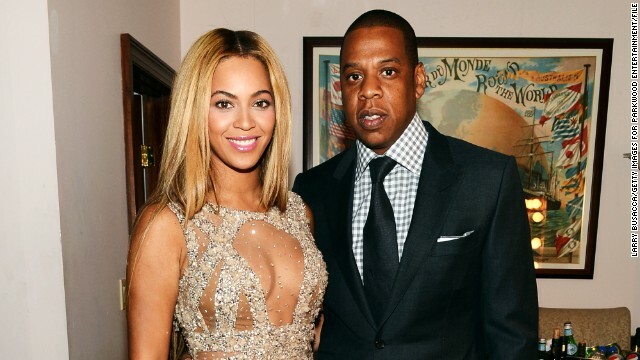 Forbes estimates that the two musical giants have made $95 million between June 2012 and June 2013, thanks in part to their recent world tours (Jay Z went out on a trek to support "Watch the Throne," and Beyoncé has gone from Belgium to Brazil with "The Mrs. Carter Show"). But the tours are only the beginning: Mr. and Mrs. Carter also lay claim to fragrance and clothing brands, and even a sports agency. The couple's branding across entertainment and sports has placed them ahead of some of Hollywood's A-list, like Brad Pitt and Angelina Jolie. That power couple actually ranks third on Forbes' list of the highest-paid star pairings, with their combined earnings being roughly $50 million over the past year. So who's at No. 2? That would be Tom Brady and Gisele Bündchen. Both celebs each have their own side deals, from footwear to endorsements, and they're also making sizable money from their day jobs: Brady's new contract with the New England Patriots included a $30 million signing bonus, and Bündchen is the highest-paid model in the world. Put those two together, and that adds up to roughly $80 million earned between June 2012 and June 2013. Report abuse does not work on a hacked machine...it only works on outside machines. Click 'report abuse' every time you see one of these spammers advertising the dating services. Maybe we can get them off. Well, good for them. I just wish the highest earning couple didn't take millions from corrupt dictators like Beyonce does (she performed privately for Col. Gaddahfi once). Also I don't hear much about their charity work (if they do any), which is sad because I quite often see Beyonce on her private million dollar yacht and Jay Z constantly rapping about how much stuff he buys (because y'know, he's got nothing else to talk about), so it would be nice if they could maybe try to make the world a better place with their money instead of selfishly and greedily buying luxury items for themselves. After all, it is the public who has made them rich. It's fake. Even the baby is fake. saw interview with jay z and beyonce...i adore their connection and she said herself there is not control. Not toxic to each other, but to everyone else. Makes me hurl every time I see her bleached/airbrushed skin or hear her auto-tune another stupid song. Make sure all these fake dating services are reported too cnn...we still do that right? THE NAME FRED IS MENTIONED IN MACHINE 2...HARD DRIVE. mentally challenged like their friend vixen. yea I agree. ^that is for carl. I dont see any of them on here no more. peace comes on some time still. not alot though. i remember lc sayed they go on a nother blog. Monthly BJ...bust through experience project. I hear you on that one. They took that vixen back after she trolled everyone. Are they nuts?